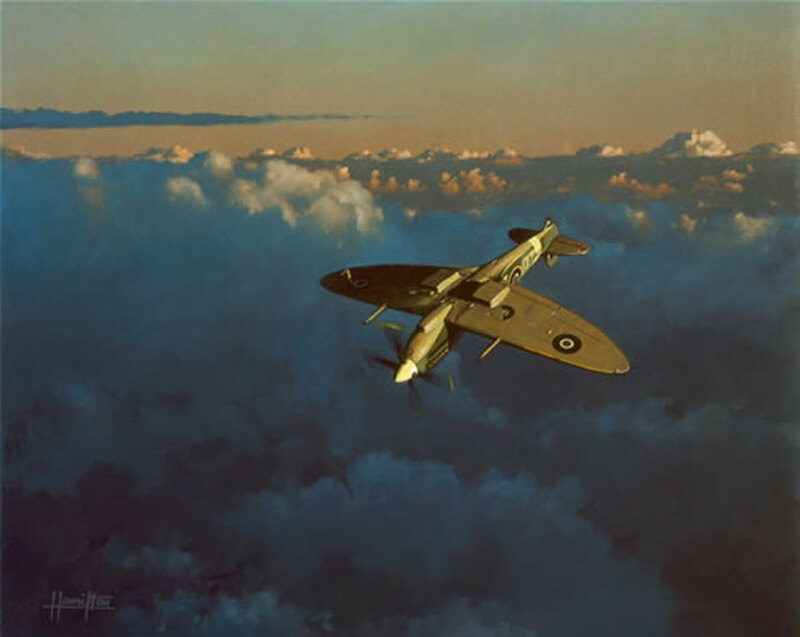 A Spitfire Mk.IX touches the last warming rays of the setting sun at the top of a loop before dropping into the deepening shadows of dusk below. I wanted to show that beautiful wing of the spit at its best, so why not upside down, looping and rolling, its pilot enjoying the light flying characteristics of the aircraft in the silent, ever changing world above the clouds. Each print is signed by the artist and Alex Henshaw. Alex was the Chief test Pilot at the Castle Bromwich “shadow” factory in Birmingham. He was responsible for running the production flight testing of all marks of Spitfire manufactured at the factory from June 1940 until the end of the war. Alongside this achievement of organisation, he did more than his share of production testing, as well as being an ambassador for the aircraft by performing flying displays to dignitaries and bowler hats etc. and helping use the already famous Spitfire to push the “War Effort”. His displays in Spits of all marks were renowned and sought after. Alex Henshaw will always be a part of the history of this wonderful fighter.